When I first requested Hallowed off NetGalley, I didn’t realize that it was the second book in Cynthia Hand’s Unearthly series. I had not read Unearthly yet, so I was a bit put off that I had to read two books instead of one. What happens if I don’t like the first book? On top of that, I finally read the description, and it was a supernatural story about angels. I disliked angels. I know that’s a weird thing to admit. But when it comes to stories, the few angel stories I have read were pretty unremarkable. So, like I do with most things I don’t look forward to, I put off reading the Unearthly series. However, one day last week, I found myself incredibly bored, and on a whim decided to give Unearthly shot, hoping that maybe it will prove me wrong. And it did. Big time. 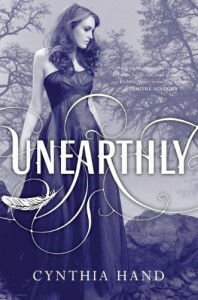 I read Unearthly in two days. I read Hallowed in one. I am obsessed with the Unearthly series to put it quite bluntly. I didn’t expect to become so enamored with the characters in this story. The main character is Clara Gardner, a typically normal teenage girl, who just happens to be a quarter angel. She lives with her mother (a half angel) and her brother (a quarter angel like her). Each angel, no matter how much angel blood they have in them, has a purpose to fulfill. When an angel comes of age, they get visions with snapshots of what their purpose will be. Clara starts to get these visions. It looks like her purpose to save a young man from a forest fire. With the assistance of her mother, they figure out that her purpose will be fulfilled in a small town in Wyoming. So the Gardners pack up, leave California and move there. There is a bit of set-up in the first book, and it all leads to quite a conclusion. You meet many characters, some I adored more than others (oh my sweet Tucker!). Hallowed takes place a little after Unearthly ends. Clara is trying to understand the consequences of her decision and what they could possibly be. On top of that, her mother is still holding onto secrets, and Clara is desperate to know what they are. Everything starts spinning out of control in Hallowed, and it becomes hard to predict some people’s motives or what the future may hold. The author does a great job with properly pacing the plot. The first book could have been easily boring with all that set-up. Yet it wasn’t, because things were actually happening while she set up Clara’s world. It’s impossible to not get swept away with this story, especially when Clara starts spending time with the very human (and adorable) Tucker. Then in Hallowed, so many secrets are revealed and there’s this terror building up in the storyline that made me go crazy because I was afraid what would happen next. Also, Hallowed gets a little more in depth with some themes. The most interesting of those themes is free will. Part of being human is having free will, hitherto when it looks like your destiny is already made up for you, do you still really have free will? It’s an interesting question, and I look forward to exploring it more in the next book. From what I know, it looks like Unearthly series will be a trilogy, at least for Clara’s point of view. However, I couldn’t disregard some hints of finality in Hallowed’s ending. Now this is where I issue a SPOILER ALERT, SO PLEASE DO NOT CONTINUE READING THIS PARAGRAPH UNLESS YOU HAVE FINSHED HALLOWED. It shouldn’t come as a surprise that I love Tucker. I adore him. Team Tucker since he called her Carrots. Christian is okay, but it’s hard to get to know him when Clara is so dead-set on Tucker, and I can’t blame her for that. The ending makes it sound that Tucker is now completely out of the picture. And I hope that isn’t true. I mean, why make him such an important character, only for him to be dumped and forgotten somewhere in the middle? He has to be more than just a “test.” He has a purpose in Clara’s life and I hope that something along those lines could be revealed in the last book. I also hope that we get some good times with Clara and Angela in Italy. Let’s not forget about Jeffrey as well! Anyway, let’s just pray to the angels that Tucker takes up a serious amount of pages in the final book because I already miss him. I love when something I expect to dislike ends up being awesome. The Unearthly series is beyond awesome. I can’t recommend it enough to people who want an interesting angel story with a great romance. Hallowed centers on a big (and hair-pullingly stressful) love triangle. If romance isn’t your thing, I suggest you stay away. But if you love LOVE and want a pretty cool story to accompany it, then get to reading about Clara, angels and company! Hallowed is now in bookstores. You can purchase Unearthly or Hallowed in our TYF Store. 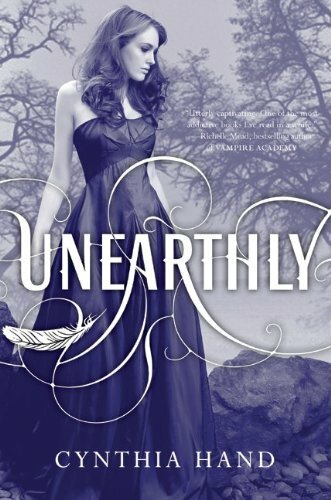 Also, keep checking back on TYF, we’ll be giving away a copy of Unearthly in our Valentine’s Day giveaway this week! Book News: Cover Reveals for Boundless, Sever, Through the Ever Night & more!